Voice notebook can be used to input text by voice and transfer audio files to text (make transcription). Go to the page of the voice notebook on App Store and install it. Works on devices with iOS 11.0+. In most cases requires Internet connection. 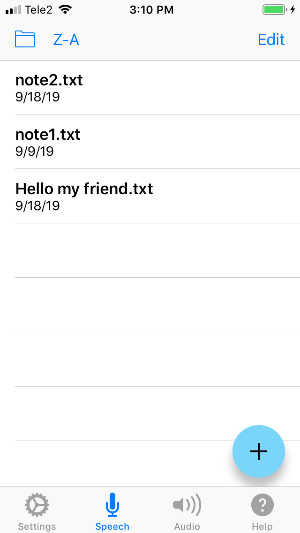 To create a new note, click on the top line Create new note. 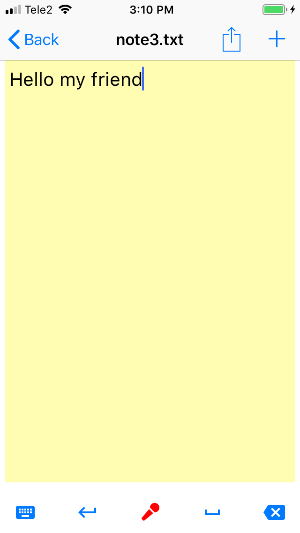 To select an existing note, click on the title of the note. To rename a note, long press the name of the note. To delete a note, select the Edit button in the navigation bar than delete the note. Press the button with the microphone for dictation. To edit the text, you can open the keyboard (button in the center), or use the erase button (right button). To send the text, select the Send icon in the navigation bar. Transcribing is possible only with an active subscription to this option. To import an audio file for transcription, click the line Import audio file. With each audio file, a text file is associated with its transcription. 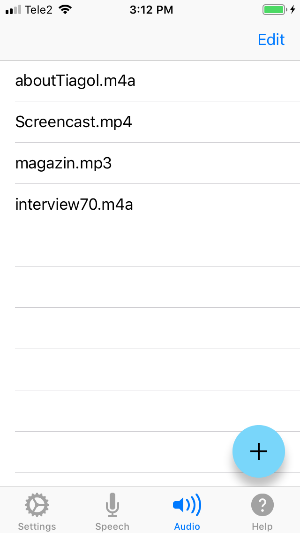 All actions (delete, rename) for the audio file are duplicated for that file. To select a file for transcription, click on the name of the file. To rename an audio file, make a long press on the file name. To delete an audio file, select the Edit button in the navigation bar and than delete it. At the top of the window is a slider that shows the current position in the audio file. Moving the slider manually you can change the playback place in the audio file. The center bottom button toggles the transcribing / listening mode of the audio recording. The left button at the bottom turns on the audio playback. 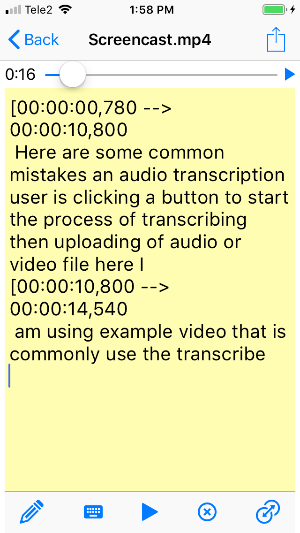 The right bottom at the bottom serves to transfer the time stamps in the received transcription to the Youtube subtitle format and back. In common settings, the voice input language, the font size of voice notes and transcriptions are selected. In addition, you can disable the auto-lock screen (No sleepping). Last option is enabled only in Premium. 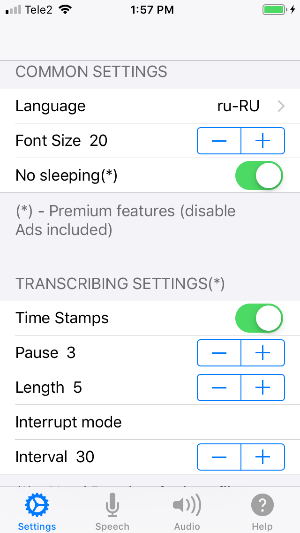 The Time Stamps switch enables time stamping when transcribing audio. Spinner Pause sets the maximum allowed pause time in speech in each subtitle. If this time is exceeded, a new subtitle will be started. Spinner Length sets the maximum allowed time of one subtitle, if this time is exceeded, a new subtitle will be started. Enabling the Premium mode removes ads from the app and enables the No sleeping option. Premium alse remove the limit for the length of transcribing audio files. The Restore button can be used to restore purchased premium features if for some reason they are not automatically enabled. Recovery requires a connection to the Internet. If you have not found the answer to your question, please contact the developer and we'll try to resolve your issue.